Can’t believe a whole month has passed and it is once again time for another blazing round of blogging with the Carnival of Journalism. This time, our fearless leader David Cohn has asked us what steps we, as individuals, could do to increase the number of news sources in our communities. Probably the most impressive effort to increase local news sources at the University of Memphis is just launching now. My colleague Dr. Lurene Kelley and our new multimedia capstone class are taking on the hyperlocal reporting challenge by providing extensive online coverage of one community: Cooper Young in Midtown Memphis. Their site just launched this very week, and they hope to not only give these senior-level students a culminating experience that brings all of their writing, reporting, photojournalism, video and web production skills together, but also to offer this neighborhood the kind of extensive coverage not available from the major metro media. Because this is a new course, enrollment is small, but will grow in subsequent semesters, and Kelley plans on expanding to other neighborhoods as well. In my reporting and social media courses, each student chooses a beat and creates a beat blog, which may range from anything as serious as local politics to something more fun like Memphis music or MMA. While the beats aren’t explicitly local per se, in-person reporting is required so they definitely have at least a local angle. These blogs are often fledgling efforts by inexperienced students, but local voices get heard that might not otherwise get media attention. You can check out my undergraduate and graduate students blogs via the blogrolls on our class sites. We are just getting started this semester, so there may not be much content yet. 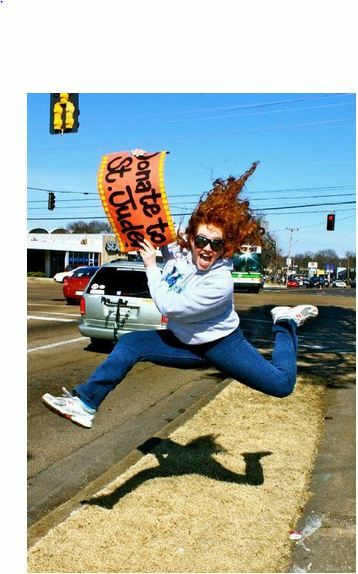 My student Nicole Blum took this great Twitpic of a local fundraiser for St. Jude. This semester, my social media students are also using a variety of tools such as Twitter and Flickr to report the news and share stories. For example, during a major snowstorm in Memphis last week, my students took photos and reported on everything from road conditions and wrecks to sledding spots from all over the greater metro area using the class hashtag #j4801 and #snOMG. My students have also been participating in campus and city-wide “Scavenger Hunts” that in a sense are also a form of local news reporting as they gather photos and quotes that tell a story about university and civic life. In fact, if you check out the hashtag #j7200 this week you could learn a little bit about some of the places and people in Memphis. My goal is to continue to build upon and expand efforts such as these and get more of our courses involved in these efforts. I run a hyper-local reporting website where people can post news, events, opinions tagged by the geolocation. It is hyper-local reporting for anywhere. I would like to invite your students to go to http://www.localbyus.com and get involved in their communities too.